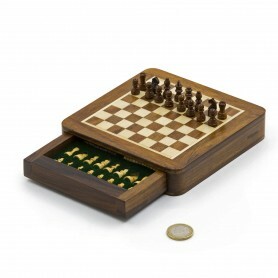 3D CHESS CONFIGURATOR TRY IT NOW! Here is a variety of Chess Sets, a game complete of Chess Pieces and Chess Board. Here you will find Chess Pieces and Chess Board combined as indicated in the tabs of each product. Wooden magnetic sets, particularly suitable to be transported, to play in all places and any moment, even during traveling! 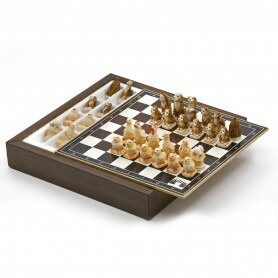 Characteristics and uses completely different for the Chess Boards in alabaster: handmade in natural stone and colored, indeed a perfect piece of furniture; because there are very particolar items, available only on reservation of which you can ask us informations and photos. This Chess Sets are sale as showed, already combined with Chess Pieces and Chess Board. 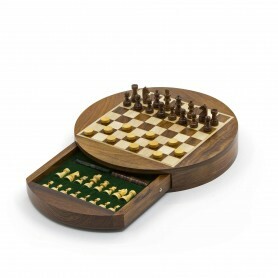 All the Chess Sets are made of walnut and maple. Their peculiarity is that they are magnetic and therefore particularly suitable for playing in all places and at all times, during the boat trip, the journey, by train or car. Some, with very modest dimensions are particularly suitable for the transport and have a remarkable ease to transport. They are a useful tool for the first steps towards knowledge to develop your own strategy game. Chess Set with chess pieces in alabaster and resin handpainted and box container for chess in wood. The chess pieces and the chess board are magnetic. Excellent for playing anytime and everywhere. Available in two sizes: diameter 16 cm, height 3 cm, square 0,6 cm; diameter 23,5cm, height 3,8 cm, square 2 cm. 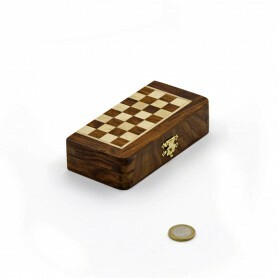 Magnetic Chess Set with internal drawer for carring the pieces made of rosewood and maple inlaid by hand with natural color, squared shape. Available in three sizes. 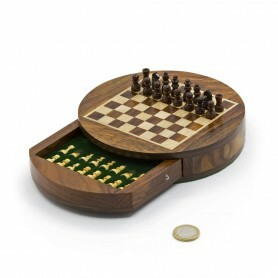 Magnetic Chess Set with internal drawer for carring the pieces, made of rosewood and maple inlaid by hand with natural color and is round in shape. Available in two sizes. Subscribe now to receive a 10€ discount for your first purchase. We'll send original content about the chess world once a month at maximum. And now and then some exclusive offers on our chess, chess boards and chess sets.